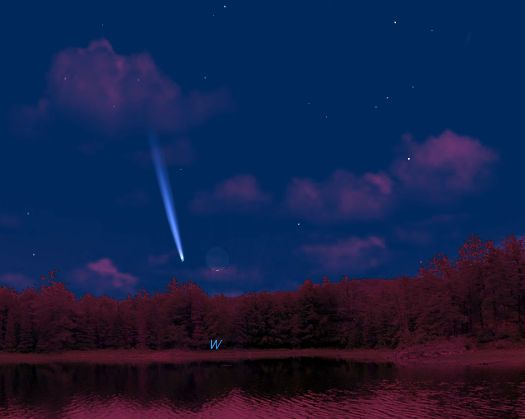 Above: Illustration courtesy of Starry Night software; it shows Comet PanSTARRS 8 degrees above the horizon 25 minutes after sunset on March 12. The software has no idea of the comet’s brightness or the length of its tail (it just adds a generic comet tail)—it’s unlikely PanSTARRS will look this dramatic (but we can dream). That’s a thin (1%) crescent moon just to the right of the comet. PanSTARRS Update, February 6, 2013: Latest word on the street is that PanSTARRS isn’t brightening as fast as hoped. Current predictions put it in the magnitude 2-3 range, about the brightness of the stars in the Big Dipper. This is likely to change, either up or down (welcome to the world of comet watching), as PanSTARRS approaches and passes perihelion (March 10). ISON remains on track for something truly special late this fall. Stay tuned…. PanSTARRS Update, February 23, 2013: After enduring a few weeks of fading hope for PanSTARRS brightness (revised estimates were calling for best-case magnitudes ranging from 2 to 3, and some were in the magnitude 4 range), recent observations have the comet brightening at a faster rate that might put it at magnitude 2 or brighter. I still don’t think we’ll really know what to expect until PanSTARRS reaches perihelion on March 10, but suffice to say it continues to bear watching. Keep your fingers crossed. PanSTARRS Update, March 4, 2013: Things just keep getting better. PanSTARRS is putting on a great show for the Southern Hemisphere, and it’s about ready to enter Northern Hemisphere skies. Current estimates have PanSTARRS brighter than magnitude 2 right now, and we’re still nearly a week out from perihelion. As it continues to approach the sun, look for PanSTARRS to brighten to magnitude 1 or maybe even brighter. That means it could be visible north of the equator as early as March 7, with improving chances for viewing for at least the next week as it separates from the sun a little each evening. There’s a lot of excitement in the astronomy community about a pair of comets heading our way in 2013. In late-November and December (and maybe into January), Comet ISON could put on a once-in-a-lifetime celestial display, but before ISON we may be treated to a pretty good warm-up when Comet PanSTARRS graces Northern Hemisphere skies in March. Media hyperbole notwithstanding, the unpredictability of comets is a source for great anxiety among those anticipating these celestial visitors. The safest bet is that PanSTARRS and ISON will either be brighter or fainter than predicted (comet history is rife with examples of both), but it’s just that kind of uncertainty that makes comets so special. A comet is a ball of ice and dust a few miles across (more or less) orbiting the sun in an eccentric elliptical orbit: Imagine a circle stretched way out of shape by grabbing one end and pulling–that’s what a comet’s orbit looks like. Looking down on the entire orbit, you’d see the sun tucked just inside one extreme end of the ellipse. The farther a comet is from the sun the slower it moves, so a comet spends the vast majority of its life in the frozen extremities of our solar system. Some comets take thousands or millions of years to complete a single orbit; others complete their trip in just a few years. As a comet approaches the sun, stuff starts happening. It accelerates in response to the sun’s increased gravitational pull (though just like the planets, the moon, or the hour hand on a clock, a comet will never move so fast that we’re able to perceive its motion). And more significantly, as the comet approaches the sun, increased heat starts melting the frozen nucleus. Initially this just-released material expands to create a mini-atmosphere surrounding the nucleus; at this point the comet looks like a fuzzy ball when viewed from Earth. As the heat increases, some of the material set free is discarded to form a glowing tail (glowing by reflected sunlight—a comet doesn’t emit its own light) that points away from the sun. The composition and amount of material freed by the sun, combined with the comet’s proximity to Earth, determines the brilliance of the display we see. With millions of comets in our Solar System, it would be easy to wonder why they’re not a regular part of our night sky. Actually, they are, though most comets are so small, and/or have made so many passes by the sun that their nucleus has been stripped of reflective material, that they just don’t have enough material left to put on much of a show. And many comets don’t get close enough to the sun to be profoundly affected by its heat, or close enough to Earth to stand out. Most of the “periodic” comets—comets that make regular appearances—are well known to astronomers. These comets have usually lost so much of their material that they’re too faint to be seen without a telescope; a notable exception is Halley’s Comet, perhaps the most famous comet of all. Halley’s Comet returns every 75 years or so and usually puts on a memorable display. Unfortunately, Halley’s last visit, in 1986, was kind of a dud; not because it didn’t perform, but because it passed so far from Earth that we didn’t have a good view of its performance on that pass. Then there are the “non-periodic” comets, which pivot the sun only once in thousands or millions of years. New non-periodic comets are discovered each year; every once in a while astronomers determine that one of these discoveries is large enough, with a favorable orbit that sends it close enough to the sun to ensure lots of reflective material will be shed, and close enough to Earth that we’ll have a good vantage point, that it just might put on a spectacular display. Enter Comets PanSTARRS and ISON. Every comet has a different physical make-up, so there’s no way we can tell how it will react during its encounter with the sun. Astronomers also suspect that on its first solar approach an incoming comet may shed a thin, highly reflective outer layer when it’s still a good distance out, giving us a false impression of its intrinsic albedo (reflectivity). Therefore we can’t be certain if a newly discovered comet that appears relatively bright at a great distance (but still much too dim to be seen without a telescope) is going to continue shedding reflective material, or peter out before it arrives. An even bigger concern is whether the comet will survive its encounter with the sun at all. The closer a comet passes to the sun, the more it is likely to shed the ice and dust a spectacular display requires, but some sun-grazing comets have passed so close to the sun that they completely disintegrated. In other words, we have no way of knowing whether PanSTARRS and ISON dazzle or fizzle—all we can do is wait. And prepare. Fortunately, we do have one certainty to work with: the comet’s orbit. We know with great confidence where it will appear (or where it should have appeared had it survived its encounter with the sun) and when it will be there. PanSTARRS makes its closest approach to the sun, “perihelion,” on March 10. If we’re lucky it will appear as a fuzzy ball low on the western horizon of Northern Hemisphere skies shortly after sunset in the second week of March (it’s done with the Southern Hemisphere). Each evening PanSTARRS will appear above the western horizon shortly after sunset, a little higher and (probably) a little dimmer than the night before. But as it rises each night, it moves farther from the sun into darker sky, so while PanSTARRS may be dimming slightly, the sky surrounding it may darken faster than the comet dims, perhaps and for a week or so (this is anybody’s guess). That would make PanSTARRS more visible as the first week after perihelion progresses. Since PanSTARRS’ tail material may have been stripped by its close encounter with the sun, it will need time to reform and may lengthen with each passing day, another variable that can’t be predicted. PanSTARRS will eventually rise into the darker part of the sky; by the end of April it will be visible all night in the Northern Hemisphere. But by then it’s very unlikely to be bright enough to be viewed with the unaided eye. But one of the great thrills of comet watching is the uncertainty. Just as some comets disappoint (Google Comet Kohoutek), others astonish. Hale-Bopp was much heralded before it arrived in late 1996, but nobody expected it to remain visible to the naked eye for eighteen months. And in January 2007 Comet McNaught caught everyone off guard by suddenly brightening to become a spectacular (albeit brief) sight trailing the sun to the horizon in the post sunset twilight. Since we know when and where PanSTARRS will be visible, there’s no excuse for not preparing now (right?). Preparation starts with knowing where you’re going to shoot PanSTARRS beforehand. Look for unobstructed views to the west with no terrain for PanSTARRS to set behind before the sky is dark enough for it to appear—think beach, hilltop, mountaintop, or flat landscape. The best scenes are worthy of photographing regardless of what’s in the sky, scenes that can use the comet as an accent to take the image to the next level. I’m guessing that PanSTARRS won’t have a tail anywhere near as dramatic as the tail in the Starry Night illustration above (though I could be, and hope I am, wrong), so unless it brightens far beyond predictions and the tail lengthens more than normal (it’s happened with comets before), you won’t want to go too wide with your composition if the comet is to be your primary subject. On the other hand, even with a relatively short tail, PanSTARRS could make a magnificent accent to an otherwise nice wide scene. I plan to prepare for both tight telephoto and wider landscape shots. Because PanSTARRS will be in the relatively bright post-sunset sky, and any foreground subject will be in full shade (the sun’s down, but it isn’t completely dark yet), look for striking nearby shapes to silhouette against the sky with PanSTARRS glowing in the distance. For example, near my home in Sacramento the best candidates will be the oak trees dotting hillsides east of town. I’ll need to be on their east side, facing west. Mountains that stand out against the horizon will work nicely too, though remember that PanSTARRS will already be quite low as the sky darkens, and it will be dropping toward the horizon with each minute (along with everything else in the sky)—if the mountains you choose are too high, or too close, PanSTARRS will disappear below your horizon before the sky is dark enough. For example, Mt. Whitney as viewed from the Alabama Hills might make a great foreground subject for PanSTARRS, but from the Alabama Hills Mt. Whitney juts about 10 degrees above the horizon—on March 15 PanSTARRS will set behind Whitney (drop below 10 degrees) about 30 minutes after sunset. So unless PanSTARRS is extremely bright, it might not be visible at all before it disappears below the mountains. My general approach to capturing foreground detail in twilight scene like this is to meter on the brightest part of the sky, setting an exposure that’s as bright as possible without overexposing (a graduated neutral density filter helps). After you click, check your histogram to make sure you haven’t blown out the highlights. If at all possible (if your camera shows it and you understand how to read it), I strongly recommend checking each of the channels in the RGB histogram to make sure you haven’t lost any color. On the other hand, if it’s a silhouette I’m going for, I’ll underexpose slightly to hold the color in the sky and/or water. In this case a graduated neutral density filter is unnecessary. By the time PanSTARRS drops below the horizon, the foreground will be so dark that my exposures will need to be quite long. But since PanSTARRS is in fact moving at the same speed (from our terrestrial perspective) as all the stars and planets, I’ll want to monitor my shutter speed to avoid motion blur (the longer my focal length, the more I’ll need to worry about long exposure motion blur). I’m guessing for my wider shots I’ll be okay at 15 seconds, but I’ll still magnify the image on my LCD to determine whether I need to bump my ISO further to allow an even faster shutter speed. For wide shots a graduated neutral density filter will help hold down the brightness of the sky enough to enable you to save the twilight color while bringing out some foreground detail. For ocean scenes, where the horizon is flat, I prefer a hard-transition GND; my 3-stop reverse GND will probably get the most use. You could go super-tight and fill the frame with nothing but comet and sky—I’ll probably try a few of these. But with no foreground, nothing about these compositions will set them apart from the thousands of similar compositions taken from anywhere else in the Northern Hemisphere. Most of my tight shots will include some landscape feature silhouetted against the sky or water. In the telephoto shots that include a foreground subject, the farther from the silhouetted subject I can position myself, the longer the focal length I can use, and the larger the comet will appear in my frame. But don’t forget that the more you magnify with a long focal length, the greater the motion blur you’ll capture—a higher ISO to increase your shutter speed is usually a good idea. Remember that we’re photographing PanSTARRS after the sun has gone down, but before the sky is completely dark. So for my wide shots I’m going to look for water because water reflects the twilight sky so nicely. I’ll be leading a workshop on Maui during what promises to be PanSTARRS prime-time (the week of March 8-15), so finding water won’t be a problem for me. But no matter where you are, you should be able to find a westward view of a river, lake, or beach. A particular advantage of photographing PanSTARRS from the beach is the an unobstructed view of the horizon, giving me a very long and clear line of site to PanSTARRS (even better would be shooting downward at the horizon from a mountaintop, like Haleakala). The night I’m targeting as potentially off-the-charts-special is March 12 (image at the top of the page). That evening PanSTARRS will be aligned with a sliver-thin slice of crescent moon, separated by less than 4 degrees. The next night the moon will be higher, about 10 degrees (the width of a fist held at arm’s length) directly above the moon, with PanSTARRS’ tail pointing directly at the moon. If the tail is long enough, it will appear to pass right through the moon. Read the history of my relationship with comets in my January 11 post. 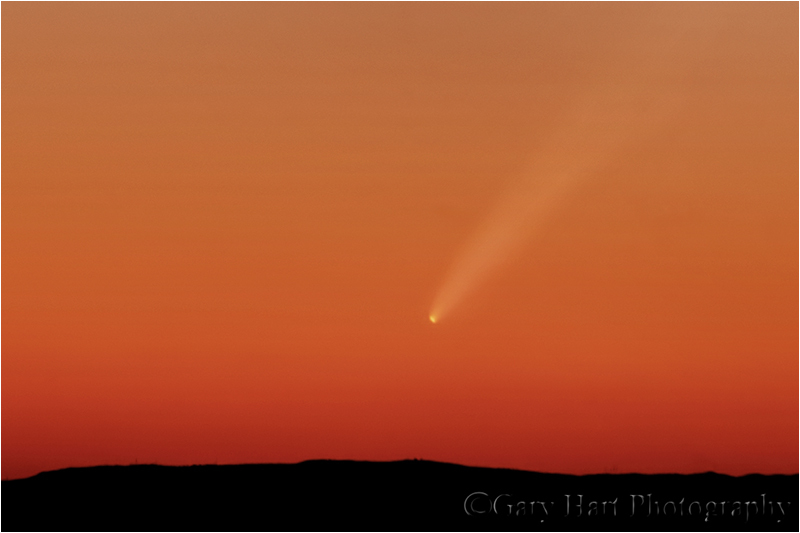 Gary, thank you so much for this fantastic tutorial on how to photograph PanSTARRS! Along with ISON, this promises to be a great year for astro shots. Thank you, Chuck. Yeah, I’m pretty excited about 2013–fingers crossed. Find a haze-free spot with a clear view to the western horizon at sunset—the ocean or a hill or mountain top will be ideal. PanSTARRS will follow the sun to the horizon, almost due west. Each day it will be slightly higher and a little north. Your biggest problem will be finding it in the twilight brightness—if PanSTARRS doesn’t brighten above magnitude 2 it’ll be tough to see until it rises higher, probably not until around March 10 or so (after that it will start dimming slightly each day). Assuming a clear view to the western horizon in the Northern Hemisphere, differences in viewing from location to location with clouds and air quality (light pollution won’t be a big deal until it rises above the twilight glow later in March). Much obliged on this blog post. The wife and I are going to try things out tonight and see what we can do. If they go well, or maybe even if they don’t, I’ll try again on Wednesday.